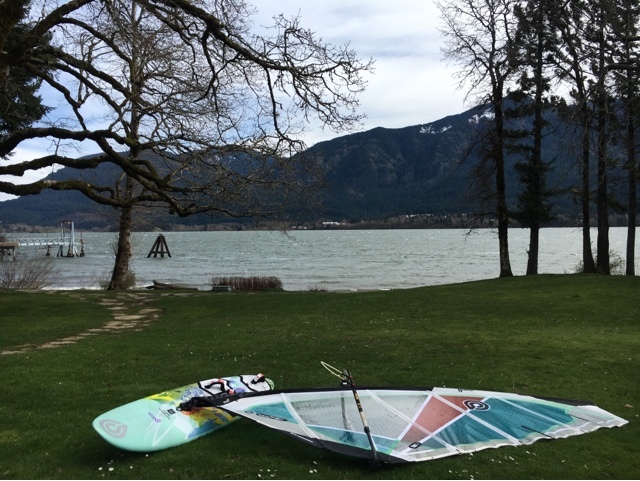 20 knots: 2016 season is on! Welcome back! Yeah I've been slacking off. 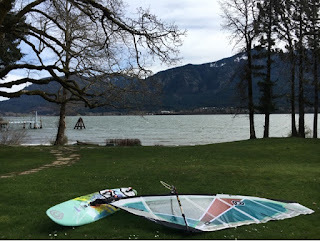 But here we are, it's 2016, my 10th windsurfing anniversary. Yeah 10 years and I can't still land a damn forward. Anyway, today was a pretty nice season opener at Stevenson. E at 25 knots. I was on 86/4.2, with my "east wind" 24 cm center fin. (I call it an East wind fin because it's massive and gets me back to the launch on East days when wind and river current go in the same direction). I was slightly overpowered, so I had do downhaul the crap out of the sail. There were three other windsurfers out, it was good to see other people!